Imagine being able to punch a ninja through the chest, rip out their heart and then squeeze it to drink the remaining blood left for nourishment. All it takes is two fatal words — “finish him” — to violently kill an opponent this way while playing “Mortal Kombat.” In fact, the violence in this 1992 game was so excessive that it resulted in the ESRB rating system, which assigns age and content ratings to video games in order to protect children. But we know the tragic truth — that senseless killing doesn’t exist only in video game fantasy worlds. It rips apart and ravages lives in classrooms across the nation. The recent shooting at Marjory Stoneman Douglas High School in Parkland, Florida, has opened up a myriad of responses from government officials on how to stop school shootings. Of all the possible causes, President Donald Trump believes that violent media, specifically video games, has a significant negative impact on young minds and connects to shootings. Pulling a causation between violent video games and increased violence in minors is not only shortsighted and unnecessary, but doing so bypasses an opportunity to address other more relevant and deep-seated issues. Whenever these shootings happen, they are usually the result of other factors such as gun control, school safety and mental health problems. And while finding the real root of a shooting is complex, blaming video games is hardly the way to address the problem. Of course, it is understandable why some people are eager to point fingers at video games for these school shootings — they’re far more interactive than movies, comics or social media. It certainly doesn’t help that most of today’s popular video game franchises are M-rated games with graphic violence — “Call of Duty,” “Battlefield,” “Grand Theft Auto,” “Mortal Kombat” and “Resident Evil” are just a few examples. This rise in M-rated violence might seem like a reasonable connection for the recent school shootings. However, a little common sense is all you need to find that there is no causation. 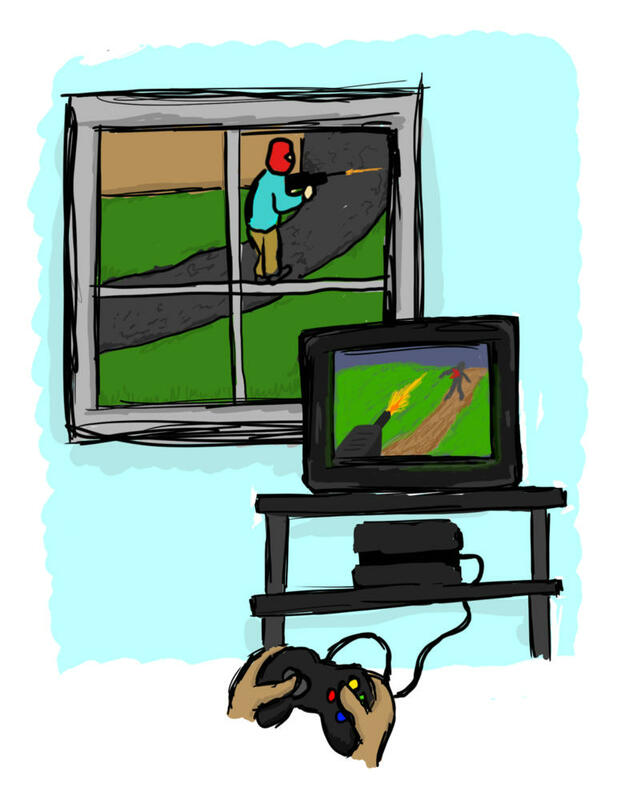 Plenty of scientific studies show no link between violent video games and criminal behavior. For example, researchers from the American Psychological Association found that while there is evidence of a link between violent video games and increased aggression, it’s not sufficient enough to say that playing violent video games leads to criminal behavior. A study at the University of Missouri came to this same conclusion, adding that no link exists between the games and violence in teenagers with attention deficit disorder or depression. If these studies don’t speak loudly enough against video games’ undeserved bad reputation, there may be more that suggest they actually have a positive impact on players. As games become more and more violent, crime rates can actually drop. A study published in 2016 showed that according to violent crime logs from weeks after a violent video game release, general violence actually decreased. Some have theories about violent video games possibly causing this decrease. Maybe the catharsis provided by violent games provides a way for people with violent tendencies to release their anger and aggression to virtual characters rather than at real people. In the wake of a tragedy, it’s easy for Trump and concerned parents to point to media for the source of these shootings — it does have a lot of influence in our culture, and therefore a lot of influence on our actions. But in doing so, they neglect the more crucial areas of discussion. In order to prevent school shootings, experts such as Ron Avi Astor proposed several ideas. More attention needs to be placed on stopping unhealthy obsessions with firearms — especially from those who have thoughts of murder — reducing weapons on school grounds and limiting powerful weapons that can kill lots of people quickly. Video games are a wonderful medium that have had tons of positive effects on young children and people around the world, such as improved problem-solving skills critical thinking, and in some cases, better social skills. In fact, violent games such as “Spec Ops: The Line” have used their depiction of violence in war to persuade gamers that the actions they do are wrong and that there is no honor or justice in war and violence. It’s far past time for the video game controversy to be put to rest — just because overly graphic video games are popular and influential doesn’t mean they are to blame for school shootings. If parents are concerned that violent video games will have a negative influence on their kids, they simply need to take better care and be sure they do not buy or play them. The ESRB rating system is in place for a reason — to make sure that children cannot simply go to the store, buy the latest “Mortal Kombat” and be exposed to graphic fatalities. The sooner Trump rejects these ill-conceived notions of violent media being the motivator of these shootings, the sooner we can start looking at the real causes and the sooner we can find solutions.